There’s not many things more relaxing that sitting in front of a warm, cozy fire. Many enjoy the aroma coupled with the sound of crackling wood; while others prefer the convenience of a gas burning fireplace—not wanting to sacrifice on ambiance. 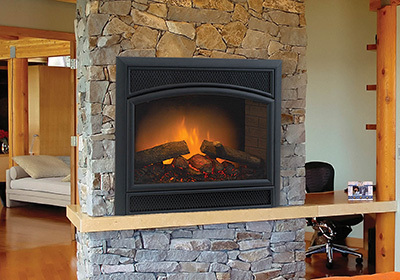 No matter your taste or style, Schumer Brothers offers a wide variety of fireplaces. There are many models to choose from and each has its pluses and minuses—more minuses if used in the wrong application or improperly installed. That’s why you should trust the experts at Schumer Brothers. They will provide the expertise needed to ensure you have the right fireplace for your specific needs and wants! Can I heat my home with a fireplace? - Do I go with a vented or ventless application? - What is the most important benefit—heat or the realistic looking flame? - Does anyone in the home have allergies, asthma, or other respiratory issues? - What kind of a budget is being set aside for installation and use? These are questions Schumer Brothers can answer. They will provide large selection of fireplaces to meet the exact mood and look you’re wanting. Can I install a gas fireplace myself? You’ve been watching the DIY network, haven’t you? Remember the installers on those shows are professionals with many years of experience and all the right tools. The old cliché “You’re playing with fire!” is a real concern here. Do you know how to properly install gas fittings; know how to check for leaks; know how to calculate the right combustion ratio of fresh air to natural or LP gas; know how to properly calculate the venting size to the fireplace BTU rate; thus decreasing the effects of nitrous oxide, carbon dioxide, and carbon monoxide? So, do you really want to take this on yourself? Schumer Brothers will professionally assist you with selecting the right style and size fireplace, professionally install all the required components with the right tools and within the correct tolerances to ensure you enjoy your fireplace for a long, long time! We’ve said it before, and we’ll say it again—your peace of mind is guaranteed with Schumer Brothers. Give them a call today. You’ll be glad you did! Schumer Brothers can help find the perfect fireplace that is right for you. Gas fireplaces come in a wide selection of models to choose from, a beautiful and valuable addition to any home! Choose from many accessories and options to personalize your very own fireplace. Our direct vent and ventless units may be located just about anywhere because no chimney or foundation is required. You can also have the convenience of instant on/off operation and automatic temperature control with an Ambient Technologies wall thermostat or a state-of-the-art remote control system. With fire at your fingertips, you’re in total control of your home comfort. SO WHAT’S STOPPING YOU FROM ENJOYING A FIREPLACE? Give Schumer Brothers a call today! Start enjoying the atmosphere of a cozy fireplace all year long. You deserve it!